Creepy facts ranging from history to torture methods and stuff to help you with your next murder! Also facts that a 16 year old me should not know but do for some weird reason... Enjoy! Urban Legend 1: She was Pushed. Make sure you're brave enough to read this story at night. PS: I DO NOT OWN THESE STORIES/FACTS! ©All credits goes to the internet. 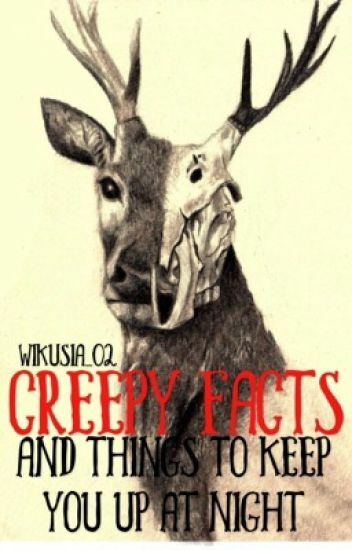 This book contains eerie yet interesting facts and stories from all over the Internet, certain to keep you awake at night. This also includes lists of top countdown for every milestone. Add this to your library, if you have not, to keep you updated and notified. Any form of feedback is highly appreciated. Short stories that are somewhat scary. But almost all will give you chills. Creepy things about Disney movies or Disney world/land Disney doesn't want you to know. This may ruin your child hood and your visit(s) to the Disney parks.